Location : The park is located in the foothills of the Himalayas in Uttaranchal. Best time to visit : November 15 to June 15 is an ideal time to visit the park but it remains closed between June 16 and November 14, when the monsoons flood the river beds and block the road links. 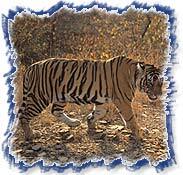 Corbett National Park in the state of Uttaranchal houses multitude of species of plants and animals but it is famous for the population of Tigers, Leopards and Elephants. Established in 1936, as the Hailey National Park it is the countrys first national park and the first sanctuary to be included under Project Tiger where the park supports a variety of vegetation making it an ideal habitat for the Tiger and its prey. The national park covers an area of 201 square miles and was named after the late Jim Corbett, the great hunter-naturalist turned author and photographer who devoted most of his life in the construction of this park. World Wildlife Fund helped in the launching Project Tiger in Corbett National Park in 1973 and was one of the first such tiger reserves in India. Rail : Ramnagar is the railway station from where the road transport has to be reach the park. For faster trains and connections to other parts one can change at Moradabad. Road : Dhikala is 300-kms from Delhi, 145-kms from Lucknow and 51-kms from Ramnagar. The route from Delhi covers Hapur-Murababad-Ramnagar. The turn off is some 7-kms beyond Muradabad to the left, marked by a small board. The route from Lucknow covers BareillyKichhaRudrapurDorahaKashipur and Ramnagar is served by good bus service to and from Nainital and Ranikhet, 112-kms north. The Flora : The topography includes hilly and riverine areas, temporary marshy lands, plateaus and ravines. The lower areas are almost completely covered by Sal trees and the park contains nearly 110 tree species. 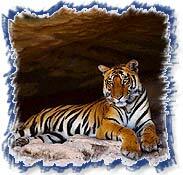 The Fauna : The animal species in the park include Tigers as well as its prey like the four kinds of Deer, Wild Boar. Leopards are generally found in the hilly areas of the park whereas the nocturnal cats found here are the Leopard Cat, Jungle Cat and Fishing Cat. Sloth Bear is seen in the lower regions of the park while the Himalayan Black Bear is seen in the higher hills only. Other animals include The Dole or Wild Dog, Jackal, Himalayan Palm Civet, Indian Gray Mongoose, Common Otter, Blacknaped Hare and Porcupine. Elephants are among one of the main attractions of Jim Corbett Park. Reptiles are spotted amongst the shores of Ramganga River and the major reptiles included are the long-snouted, fish-eating Gharial Crocodile and the Mugger Crocodile. The rocky hillside is the abode of the Ghoral or Goat Antelopes. The Langur and Rhesus Monkeys are spread in the park warning the whole Jungle with alarm calls whenever they spot either a Tiger or Leopard from tree-top perches. Jeep Safari : Jeep Safari is the most appropriate way to travel within the park. Jeeps can be rented for the park trips from Ramnagar, from the KMVN Tourist Lodge. One bus everyday goes to Dikhala from Ramnagar, stopping at the Forest Rest houses the way. The following are recommended while going on the safaris like bringing the binoculars, remaining quiet, and avoiding bright colours or strong perfumes. Elephant Safari : This is another most ideal way and most entertaining way to explore the park. The Elephant safari provisions are available at the entrance of the park.